These past 12 days I have focused on my relationship with God and what prayer means to that relationship. This has been an enlightening time for me as I not only studied prayer but have practiced it throughout this time personally. 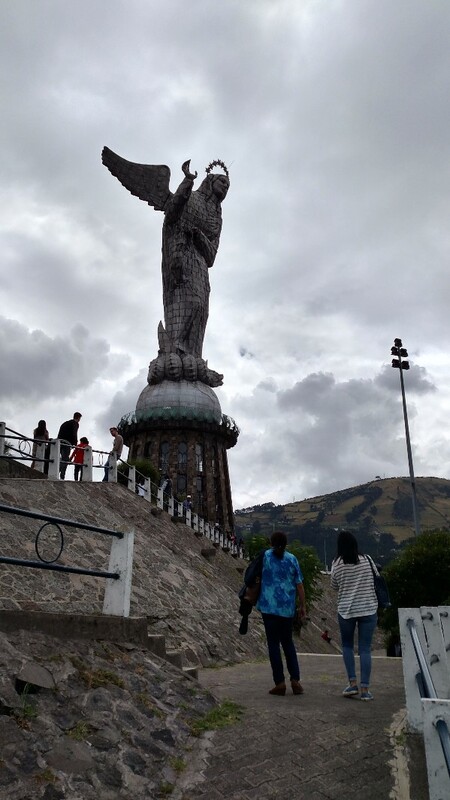 And here in Ecuador on a project like this there are lots of opportunities to pray. It is important wherever we are or whatever we are doing to make time to bathe all of that in prayer. When we pray and connect with God, God sends overwhelming peace in return. This peace allows me to not be anxious about what is in front of me. It allows me to move forward without fear. There is that blessed confidence that God is in control and nothing will cause Him to gasp, nothing! This allows me to rest in God, truly rest. Oswald Chambers stated in his July 4 devotional that “resting in the Lord is not dependent on your external circumstances at all, but on your relationship with God Himself.” That is so on point! It is all relationship and when we are in that relationship with God, we can truly rest regardless of the circumstances. I can now understand how Jesus could be sleeping in a boat being tossed by the waves and coming close to swamping and sinking. The disciples in the boat were overcome with fear. Yet Jesus was asleep! I believe He slept because He was resting in His relationship with the Father and He did that to teach us to do the same. Even in the midst of being very busy, we can rest. That’s what relationship with God brings to us. Father, my relationship with You is so important to me. Thank You for desiring to have a relationship with me. Your love is incredible and drives You to reach out to a sinner like me to pull me into Your arms and Your heart and spend each day with me. Lord, that is so precious to me for it gives me an incredible peace that fills my heart with joy overflowing. Thank You, Lord, for Your unending love for me. Thank You, Father! Amen. Today we will be touring Quito. 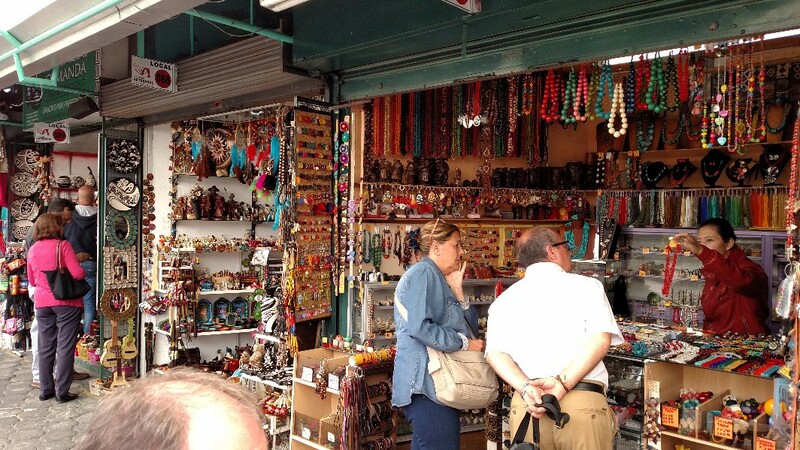 I know we will take a bus tour of the city and also visit the artisan market here. 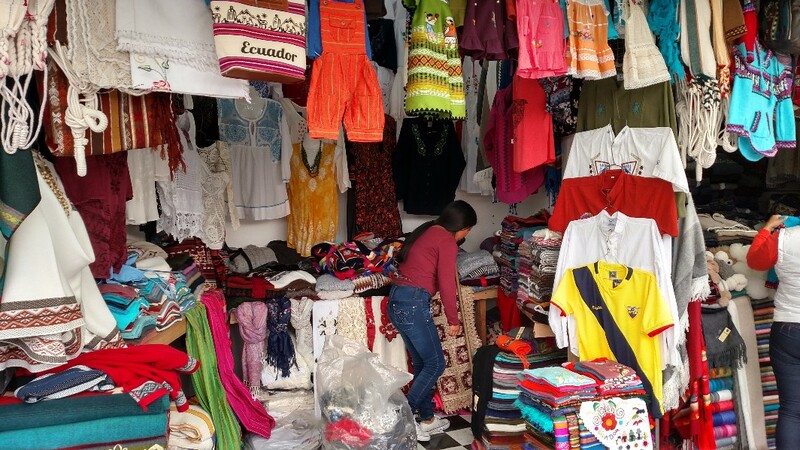 The market will be similar to Otavalo but also different as wares from other artisans in the country will be on display and for sale. I remember in 2014 we went on a tour of the city and it was very interesting. I am looking forward to doing that again. I slept well last night. The room was quiet and there were no noises of the night or the need for white noise. The bed was comfortable. 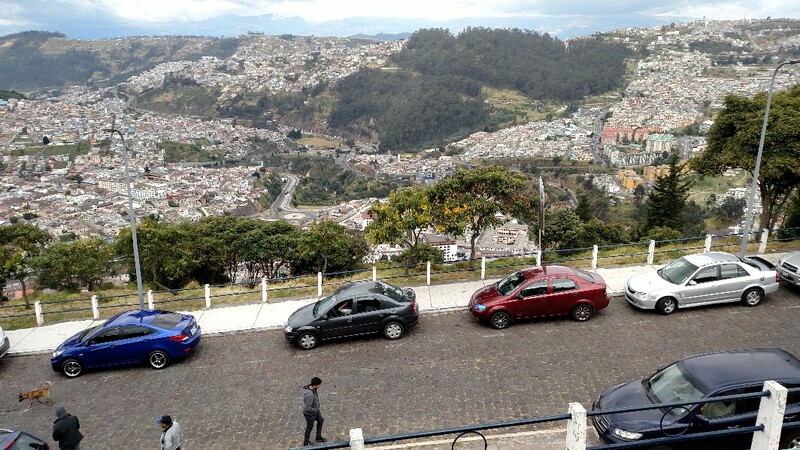 It is a lot cooler in Quito and no heat in the guesthouse so the warm blanket felt good all night long. Getting up and having a nice hot shower was good too! Soon we will gather for breakfast and then Jane and Damarys will be picking us up for our day out on the town. After breakfast at the guest house Jane and Damarys picked us up and we left to go to central city to check on the city tour bus schedule. After arriving there and parking the car we found we could start the city tour and then get off the bus when it stopped at the market so we could shop for awhile and then reboard the bus when it came around on its run a few hours later. So we got started on the city tour which took us into the old city section. Soon we were at the market so we then got off the bus and spent a few hours looking at all the things on display and even purchased a few things. Then we boarded the bus and finished the city tour arriving back at the starting point about 5 pm. At that point we went to a huge mall in the downtown area that occupies a full city block and is three levels high. At the top was a food court and we stopped at a nice steakhouse restaurant and enjoyed a good meal. Then we walked to our cars and came back to the guesthouse for the night. On one of the peaks that surround the city stands a statue of the Virgin Mary as she looks over the city. 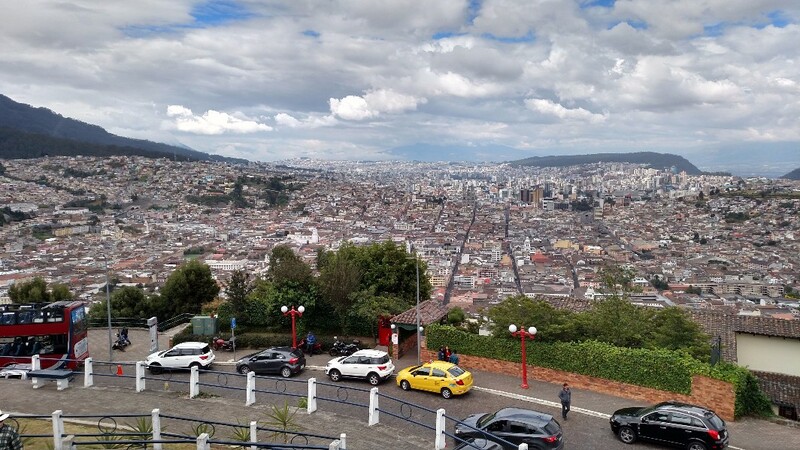 Looking over the city you can see the old city of Quito with all the low houses and the modern city of Quito with all the high rise buildings. The view of the entire city from this vantage point is spectacular. Jane and Damarys will pick us up at 3 am to take us to the airport. Our flight leaves Quito at 6:45 with arrival in Miami about noon. Tricia was to fly on to Houston and then to Colorado but her Houston flight was cancelled due to the flooding from Hurricane Harvey. So she will need to rearrange her flight from Miami on. Katie will connect and fly on to Chicago and then to Ft. Wayne and Henry will fly on to Chicago and then will rent a car to drive to St. Joseph, MI, where he will be visiting relatives. Howard and I will go to our car parked at a Sheraton Hotel and then drive back to Englewood. Today when we were waiting for the bus a woman and little girl came up to the area and sat on a park bench and opened a large plastic container filled with donuts. She set up shop to sell some donuts. Jane saw the donuts and went over to see about buying one. A conversation began with the woman and she told us she was from Venezuela and escaped all the problems there and came to Ecuador three weeks ago. She was a pediatrician and had also finished a residency in family medicine. She said the economic situation got so bad and the country was so dangerous that she sold her home, her car, her practice and she and her husband and two small children escaped into Colombia and then on to Ecuador. She is looking for work and is trying to earn a little money selling donuts. She cried a lot and Jane and Damarys talked a long time to her. Jane then gave her information on the clinic in San Lorenzo as she is looking for a family doctor to work at the clinic. This woman would add so much depth to the clinic services as she could practice both adult and pediatric medicine. After we ate dinner and were walking back to the car we met this lady and her daughter again and talked with her. She gave Jane and Damarys a huge hug for the hope they gave her. I kept thinking that God had orchestrated this. We were just standing there waiting on the bus when Jane noticed the donuts. One thing led to another and this woman whose life and career has turned upside down through no cause of her own now has hope where she hadn’t had it before. I kept praying for her throughout the day. 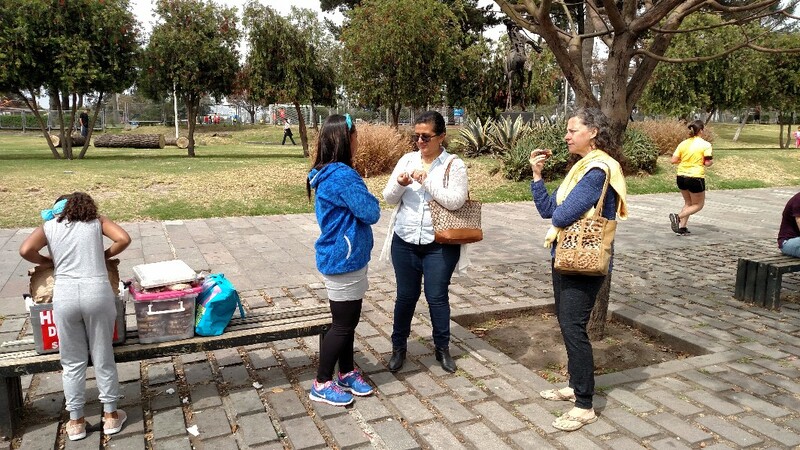 Jane and Damarys talking with the unemployed physican who is selling donuts to make money to meet her living expenses. Father, please wrap Your loving arms around this woman and her family and guide them to where You want them to be. Fill their hearts with hope in the face of extreme adversity, Lord. Give them Your peace. Thank You for nudging Jane and Damarys to talk to this woman and bring hope into her day. Father, I pray we have a safe flight back to Miami tomorrow. Thank You for bringing us here to serve You here in Ecuador. Thank You for the woman we met today. Thank You for the lives we were able to touch through You this past week. Lord, I worship You tonight. Thank You, Lord! Amen.